I am embarking on a series of tutorials for making single block quilts. I've always appreciated the simplicity of a single block approach to quilt making, as high impact and quick results are guaranteed. 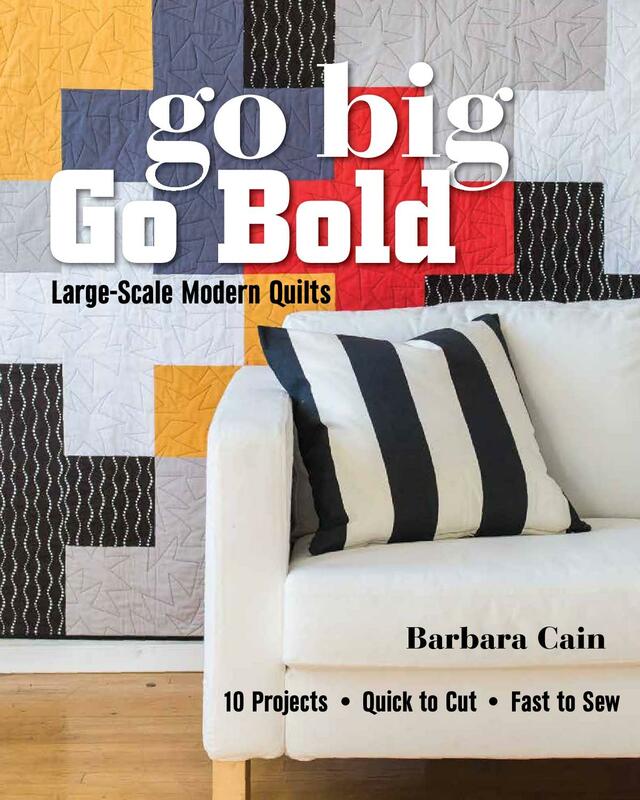 Certainly ideal for beginners, but also appropriate for any level quilter, quilts made from single blocks can be easy to make and quite pleasing to the eye. First in line for the Single Block Quilt Tutorial Series is the Snowball. 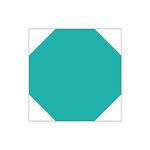 The snowball block is a basic square, four equal sides and within it, an octagon is featured. It's as simple as that but don't let this little block fool you; it can take on a multitude of appearances by varying the fabric selection and contrast between the octagons and the block's corner pieces. Each of the above quilt schematics illustrate the use of varying colors (fabrics) for the octagon (snowball), and a single, contrasting fabric for the corner pieces. The snowball visually stands forth while the corner pieces recede. 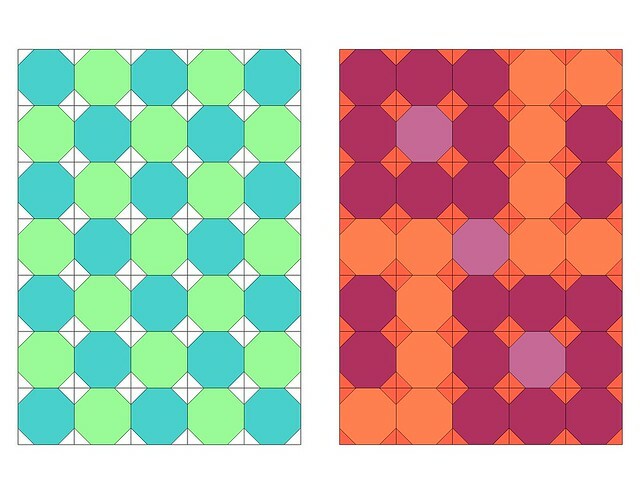 Note that although the snowball fabrics are placed identically in both schematics, the variation in color of the corner pieces make the two quilts look completely different. 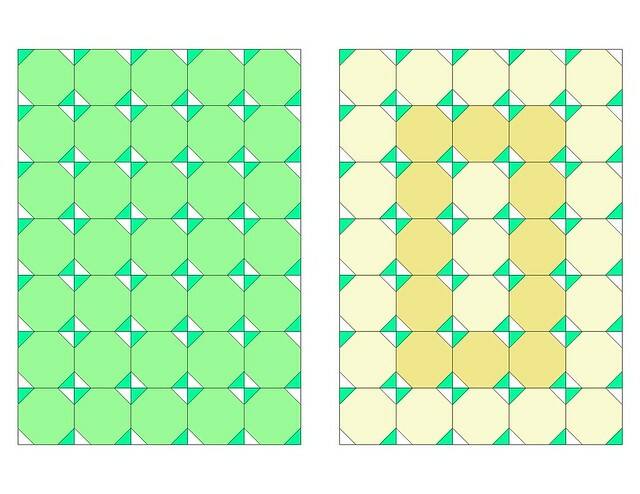 These quilt schematics (above) demonstrate how the use of similarly colored or solid fabrics can be arranged in various patterns to create distinct looks. 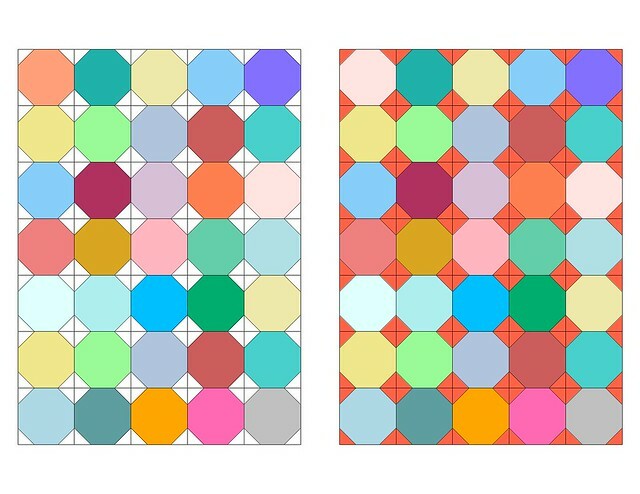 The schematic quilt on the left takes on a more traditional checkerboard look while the schematic on the right has a more '60s pop appearance. These two schematics demonstrate the use of Just one or two fabrics for the snowball and the incorporation of two different fabrics for the corner pieces. Two more striking looks from the same simple snowball pattern. The one one the left is subtle and straight forward while the one on the right poses a more formal look. This was achieved simply by introducing an alternate snowball fabric in a central, traditional, rectangular form. I think it looks like a stained glass window that might be found in a Craftsman style house. Now it's time for you to start planning your quilt. First decide the look you wish your quilt to have. Will it be formal, subtle or multi-colored? The sky is the limit so break out your crayons, colored pencils or markers and start experimenting with your aesthetic. Decide on your finished block size. Will it be 4, 6, 8, 10 or 12 inches? I'll be providing cutting instructions for each of these sizes of blocks the next time I post. Lastly, you'll need to decide on the number of blocks that you want to use. The above schematics are each made of 35 blocks; 5 blocks wide by 7 blocks long. I'm going to make 8" finished blocks in the 5 x 7 block format so my quilt will be 40" wide by 56" long. A nice throw/lap size or baby quilt size. You can choose whatever size you like. 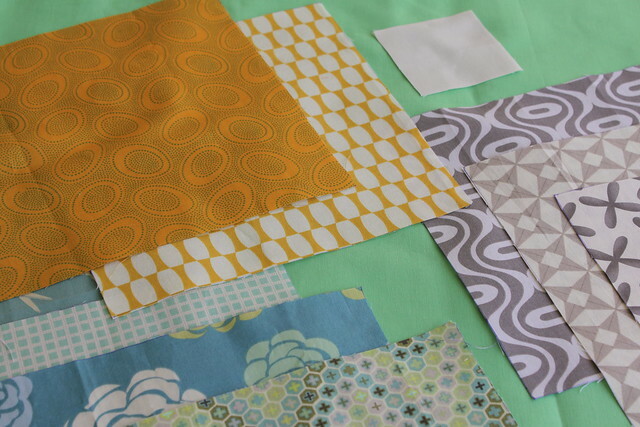 I think I'm going to use aqua, yellow and gray print fabrics for my snowballs with green and white solid corners. It looks like I need to sift through my stash and pull out a few more prints. See you soon! I will be following this to see your progress on your quilt! Thanks for this tutorial series!